"Unexpected children don't exactly announce their arrival. Ah, you know what I mean." Dagur K�ri's desolate fishing village in Iceland, as seen in the quirky coming-of-age film, N�i, is a world illuminated by harsh shades of blue and green, as if we're watching the proceedings under water. The stylized effect is dramatic, fitting for a story that K�ri describes as being similar to watching "an alien among humans." The off-balance visual approach is matched by the title character, played with an almost understated intensity by Tomas Lemarquis, as an odd, out of place and bald 17-year-old who may either be a genius or an idiot. K�ri plays everything close to his chest, allowing viewers to interpret some elements on their own, and it is this intentional ambiguity that may split audiences down the middle. If you like to have everything explained to you clearly, if you want all conflicts neatly resolved and no questions left unanswered, then N�i may exactly be the film for you. It is the kind of film where every conversation is not necessarily advancing the plot, and conversations are sometimes just that: conversations. There are quasi-art house moments, sandwiched between long, silent passages that have a David Lynch weirdness and familiarity. The plot is fairly minimal, and centers on N�i (Lemarquis), his troubles fitting in at school (attendance is not his strong suit), and his troubled relationship with his alcoholic, semi-absentee father, Kiddi (Throstur Leo Gunnarson). 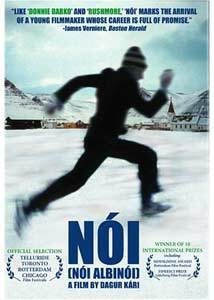 N�i is smitten by Iris (Elin Hansdottir), a quiet girl who has moved back to town after running into some difficulty in Reykjavik, and as their relationship slowly develops, the two conspire to some day run away together to Hawaii. Their plan is hatched during a lovely sequence in a small local museum, and amidst the stuffed polar bears and birds, N�i and Iris connect with a kind of refreshing sweetness that doesn't require long, carefully crafted and unnatural chunks of dialogue. They speak in small, simple sentences, but it becomes abundantly clear later on that perhaps their shared romantic dreams are not exactly so identical to one another. N�i is in constant flux, moving from being a dry comedy to sweet love story to a tragic drama at a moment's notice. Kiddi, with his penchant for singing Elvis Presley karaoke songs, or Gylfi, the local mechanic/psychic who reveals a dark future to N�i, or Lina, the shotgun-toting grandmother who always seems like she's only half there, this is a film about uncertainties and not fitting in�not just for N�i. K�ri shows a knack for making Iceland seem almost like another planet, a harsh, barren and cold place filled with odd characters literally stuck in the ice. Image Transfer Review: N�i is presented in 1.85:1 anamorphic widescreen, and K�ri's intentional icy blue-green color palette (he refers to it as a "blue-green nuance") is reproduced exceptionally well. The very infrequent moments when K�ri utilizes splashes of primary colors (as during the big tub of blood scene) really just jump off the screen. A couple of minor nicks and some minor grain issues mar an otherwise beautiful transfer. Audio Transfer Review: This is an interesting conundrum, because Dagur K�ri has stated that his film is meant to be seen in mono, with all the sound coming from the screen itself, at least until the final act. Palm has included a 2.0 stereo track that is probably closest to K�ri's original vision, but there is also a new 5.1 Dolby Digital Surround mix that definitely broadens the soundstage, most notably with regard to the musical soundtrack. The wider dynamic range on the 5.1 track is not overly obtrusive, remaining fairly close to K�ri's desire box in the sound, though in certain instances, such as when N�i is firing a shotgun at a huge mountain of ice, the sound of the gun becomes a noticeably large and booming presence. Despite K�ri's artistic intent, the 5.1 presentation delivered by Palm is clean and very atmospheric in its own right. Extras Review: The packaging for N�i is nicely done, consisting of a two-sided cover and a clear plastic Scanavo case; open the case and the interior artwork includes a handful of nutty English/Icelandic translations, such as "When is the next volcanic eruption?" and "I'm allergic to cod." The Making of N�i (19m:35s) features extensive comments from soft-spoken director Dagur K�ri, and he expounds on designing the unique look and sound of the film, as well as his intentional ambiguity with regard to the ending, though he does mention an original ending he nixed in order to keep things more open to interpretation. His comments about the sound design of the film are particularly revealing, indicative of a director with a vision that goes well beyond just simply telling a story, and K�ri also discusses his original intent to publish N�i as a comic book. Three deleted scenes are also included (14m:41s), feature comments from K�ri as to why they were cut, and how trimming them helped keep an aura of uncertainty about certain characters. Palm has also tossed in a few trailers (N�i being one of them), and the disc is cut into 18 chapters, with optional English subtitles. Ambiguous, moody, dreamy, sweet, and sometimes nearly catatonic are words that can describe Dagur K�ri's mesmerizing N�i, an Icelandic coming of age story about an outcast who dreams of bigger and better things. This is odd and beautiful, though maybe not a real mainstream title. It is worthwhile if you enjoy watching offbeat characters in unusual settings. Dagur K�ri is a director to watch. Highly recommended.